Did someone say free chocolate? 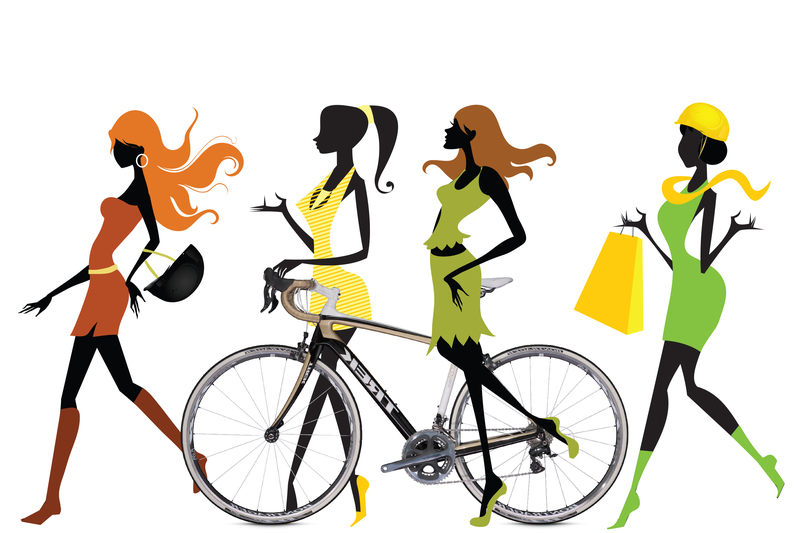 That might have been Epicenter Cycling, which is hosting its inaugural Ladies Night at 6-9 p.m. Feb. 28. The shop, located at 1730 Mission Street in Santa Cruz, will have free chocolate, wine, bike maintenance clinics and bike fittings as part of the event, as well as marked down cycling clothing for the event. 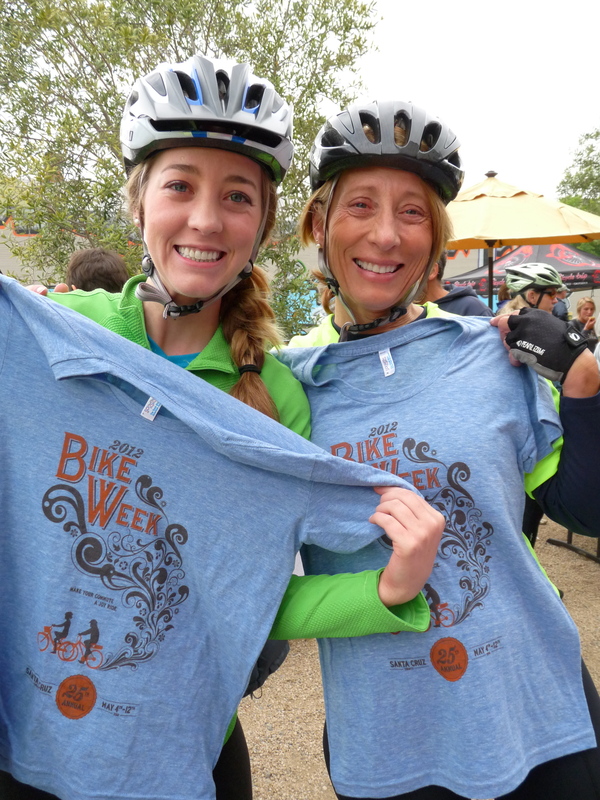 “It is a celebration of woman cyclist, as well as an invitation for ladies new to cycling to get connected in the cycling community,” Candice Covello of Epicenter wrote in an email. Ben Lomond resident Nick Sherrell settled for second place in Brazen Racing’s Coyote Hills Half Marathon at the Coyote Hills Regional Park in Fremont on Sunday. Sherrell, 19, finished the 13.1-mile race in 1 hour, 22 minutes, 2 seconds, about five minutes back of winner Brad Parker of San Jose [1:17:22]. Brian Callejas of Fremont rounded out the top three [1:24:59]. Justine Owen of Kensington won the women’s race [1:31:16]. The next Brazen Racing event is the Bay Breeze event, which includes a half marathon, 10-kilometer race, and 5-kilometer race. The event is scheduled for Feb. 8 at Quarry Lakes. Turning Wheels for Kids will host their annual event, “The Big Bike Build,” where hundreds of volunteers will build 2,500 bikes in one day! It will be held at the South Hall of the San Jose Convention Center in San Jose. Every year the request for bikes exceeds our ability to purchase them, and we hope that you will help us achieve our goal in getting every child in the Bay Area that needs and wants a bike, on one. We would like for you to be a part of this special event by making a donation that can be presented to Turning Wheels for Kids on the day of the Big Bike Build. Turning Wheels for Kids is a registered 501c3 non profit that promotes healthy lifestyles by providing underserved children with a brand new bicycle at the holidays and year round through a number of partnerships focused on preventing childhood obesity and supporting low-income families. Their partnership with the Valley Medical Center Pediatric Lifestyle Clinic helps get kids with obesity related health issues experiencing the fun outdoors as an alternative to video and computer games, TV, and texting. The value of your contribution will be a tax deductible donation. Turning Wheels tax identification number is 77-0187890. Thank you for considering a donation to Turning Wheels for Kids. Your contribution will help ensure a successful event and we are happy to share your generosity. I will bundle your donations with a list of contributors and present them on December 8 on behalf of MBOSC – Mountain Bikers of Santa Cruz. Many local mountain biking enthusiasts, including members of Mountain Bikers of Santa Cruz, are headed to the Kernville Fat Tire Fest, Oct 19-21. It’s home of the Cannell Plunge. Let me know how it goes! It is that time of the year again in lovely *Kernville, California. The leaves are changing, the crowds have dwindled and the mountain biking is at its finest in the Southern Sierras. 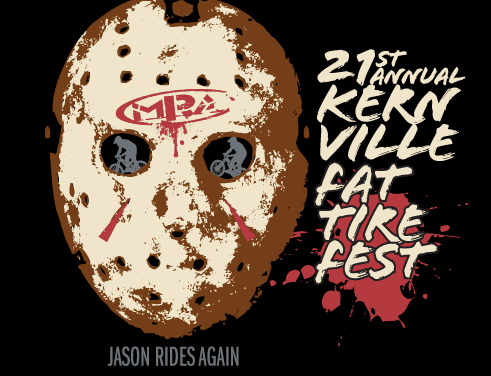 Mountain & River Adventures is hosting the 21st annual Fat Tire Festival. 2012 marks the 21st year that we have been celebrating mountain biking with guided rides, exciting activities and a Halloween Party not to be missed! Featured is a long weekend of the best trails in California. Be sure to ride the Cannell Trail, 20+ miles of breathtaking views and clean air. * Kernville is located 42 miles (68 km) northeast of Bakersfield, at an elevation of 2667 feet (813 m). The population was 1,395 at the 2010 census, down from 1,736 at the 2000 census. Ecology Action announced the 14th annual Santa Cruz County Fall Bike to Work/Bike to School Day will take place Thursday, October 4. Started in 1988, the Bike to Work/School program is the largest sustainable transportation program in Santa Cruz County. To date over 83,400 participants have bike commuted to school or work through this program. On Bike to Work Day, there will be 15 public breakfast sites from Watsonville to Santa Cruz, as well as locations in Felton and Scotts Valley, where bike commuters can receive free breakfast, basic bike maintenance, acupuncture and massages. The event will also include 44 schools that will celebrate Bike to School Day and reward theirs students who walk or bike to school. In 2011, over 7,000 people rode their bikes for Bike to Work/School Day, the largest turnout since the inception of Bike Week in 1987. The fall Bike to Work Day activities provide businesses, commuters and public agencies the opportunity to engage in active, healthy, cost-saving and pollution reducing transportation. Transportation is a leading cause of greenhouse gas emissions and riding a bike provides a direct, healthy and cheap way to reduce your carbon footprint. Bike to Work/School Day is coordinated by Ecology Action and is funded by numerous local businesses, public agencies and community groups. Major funding is provided by the Santa Cruz County Regional Transportation Commission, City of Santa Cruz, Monterey Bay Unified Air Pollution Control District, The Bicycle Trip, City of Watsonville, Fox Racing Shox, Odwalla, Whole Foods, Santa Cruz Sentinel, Jamba Juice and UCSC TAPS. Ecology Action, a California-based non-profit founded in 1970, is passionately driven to empower individuals, businesses and communities to take actions today that achieve environmental and economic sustainability. Ecology Action delivers marketing and engagement services statewide to serve consumers, businesses, public utilities, government agencies and community partners through numerous programs, some of which include Energy Upgrade California, RightLights, LodgingSavers,CasinoGreen, Earth Day Santa Cruz and Bike-to-Work. Can you spot the dude running in a tutu? It’s a quick cameo, so keep an eye out. Organizers of the 23rd Annual Sea Otter Classic are announced the Sea Otter Classic 2013 event dates. Slated for April 18-21, 2013, the event will take place again at Laguna Seca Recreation Area. Organizers will offer 11 different cycling disciplines for professional and amateur athletes. Sea Otter also presents the largest consumer expo in cycling, hosting more than 350 exhibitors featuring nearly 600 active outdoor and cycling brands. A four-day “Celebration of Cycling,” Sea Otter Classic is regarded as the world’s largest cycling festival, and features both race and recreational events in mountain biking and road biking, among others. The events draws nearly 10,000 professional and amateur athletes and 50,000 fans. The 23rd Annual Sea Otter Classic takes place April 18-21, 2013 at the Laguna Seca Recreation Area, Monterey, California. For more information, visitwww.seaotterclassic.com or call (800) 218-8411. 4/20 2013 Sea Otter Cyclocross: Laguna Seca Recreation Area, Monterey. events: Road racing, Criterium, and Circuit races on Laguna Seca Raceway. 4/18-21 2013 Sea Otter Classic: Laguna Seca Recreation Area, Monterey. 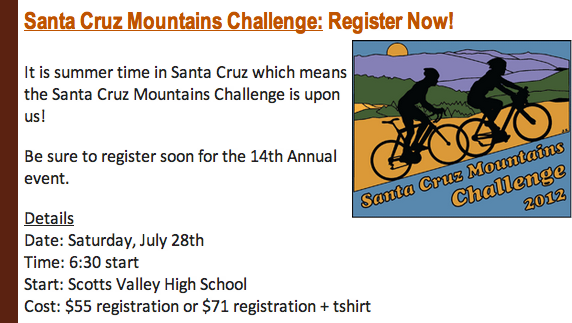 Mountain Bike events: Cross country, dual slalom, short track, and downhill. 4/20 2013 Sea Otter Classic: Laguna Seca Recreation Area, Monterey. Professional disc golfer and Capitola resident Valarie Jenkins placed second in the PDGA’s World Disc Golf Championships in Charlotte, N.C., missing the international title by just one throw over the weekend. Jenkins, who also finished second at last year’s worlds, shot a 24-under 404 through the eight-round tournament. She placed behind champion Sarah Hokom [25-under 403] of Caldwell, Idaho, but ahead of third-place finisher Catrina Allen of Phoenix. “Like the ESPN commercial I keep seeing.. “If losing didn’t hurt so bad, winning wouldn’t feel as good” #1strokefromvictory” Jenkins tweeted later. Capitola’s Nate Doss, the defending men’s world champ, placed seventh in his division with a 65-under 374 through seven rounds. Only four players make the final round. Paul McBeth of Clearwater, Fla., became the new world champ with an 83-under 387 through eight rounds. Richard Wysocki of Fort Mill, S.C., was second  and Nashville’s Will Schusterick was third . Aptos’ Shasta Criss placed 24th overall with a 43-under 396 and Avery Jenkins, Valarie Jenkins’ brother, tied for 39th with a 37-under 402. Results in this report are from the Professional Disc Golf Association’s website. Bike Tech classroom at Santa Cruz High School. ~We’ll be setting up a giant outdoor movie theater for your fun and enjoyment. ~Bring a blanket or camp chairs to make yourselves comfortable. ~Bring a picnic basket, if you like, with some snacks for the fam. ~No outside alcohol, please – leave the alcohol to the experts…New Belgium Brewing, that is. ~New Belgium Brewing will have beers on tap from their hard to find Lips of Faith series. ~100% of beer and raffle sales will be donated to Project Bike Trip’s Bike Tech Program! THE FILMS: The selected films include comedic shorts, adventure documentaries, and music animation. COST: Admission is FREE! Food and beer available by cash or check only. GETTING THERE: High fives to those who ride! Valet bike parking provided by People Power and Green Ways to School.